The thing I wanted most was a shower, so that was my very first stop. 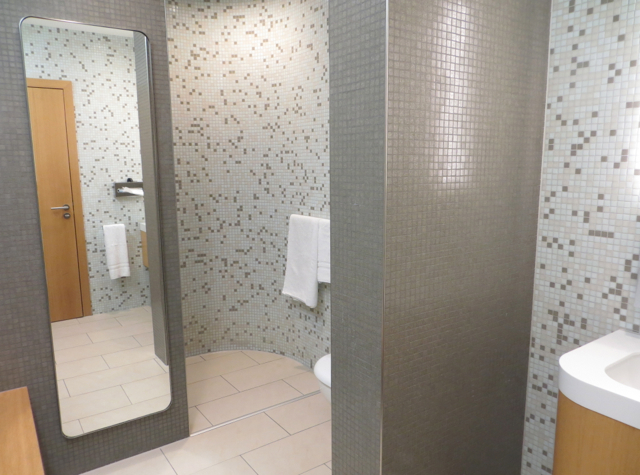 I signed in and was led to one of the several shower rooms. It was about as spartan as you can get and completely devoid of any aesthetic sense, but at least it was clean. The shower had generic combination shampoo/body wash from a dispenser, so I was glad to have brought L'Occitane bath amenities with me. 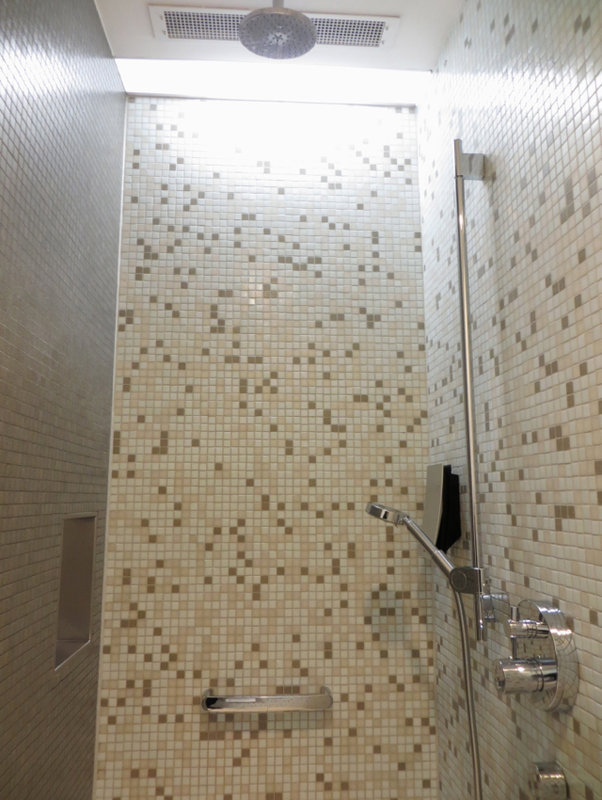 There was both a rain shower and regular shower head, and the water pressure was good. While finishing up, someone turned the handle of my door trying to get in, so do make sure you lock your door. 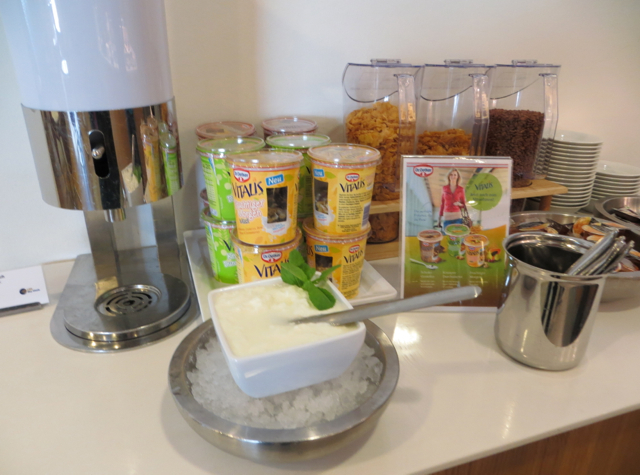 As that area was quite full, I sat at a table near the buffet, which offered breakfast items such as fresh fruit, juices, yogurt, cereal, and breads. Nothing looked all that appealing, so I settled for a fruit yogurt, and later accepted a fruit buttermilk drink that one of the staff brought by. 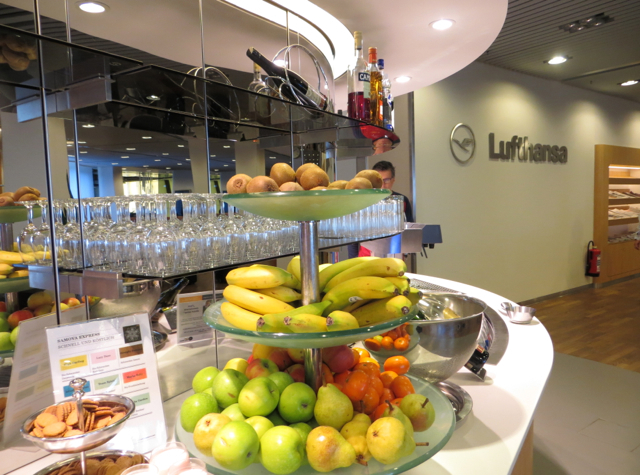 That was a nice touch, and one I haven't seen before in a Lufthansa lounge–a staff member coming by to offer something. 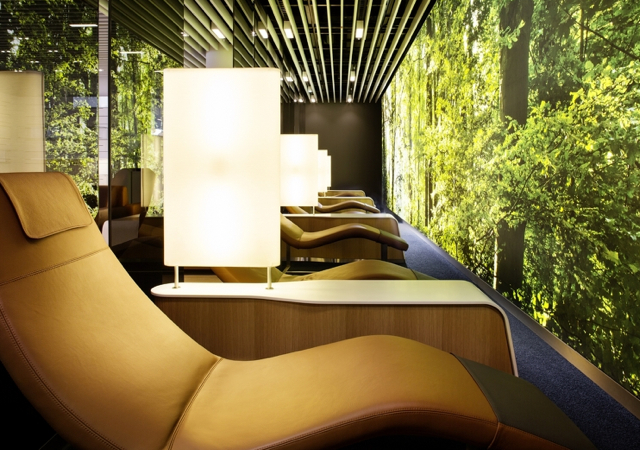 I didn't have time to use the relaxation area, but the forest motif looks nice, and probably the most aesthetically pleasing thing I saw in the lounge. That said, I wish there were actual massage chairs, as they have at Qatar's Business Class Lounge in the Doha Premium Terminal. 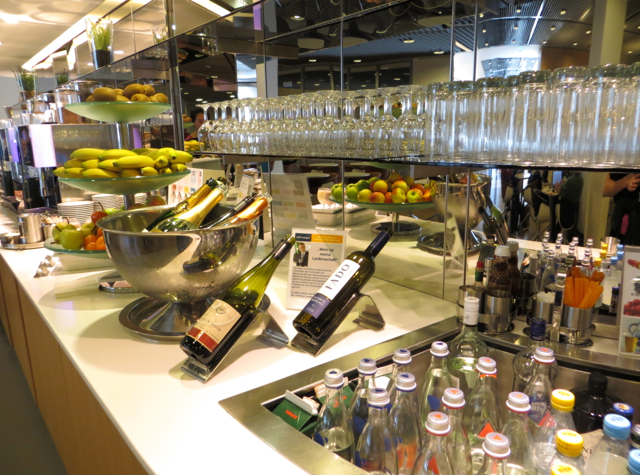 All of the above give you access to the Lufthansa Senator Lounge. 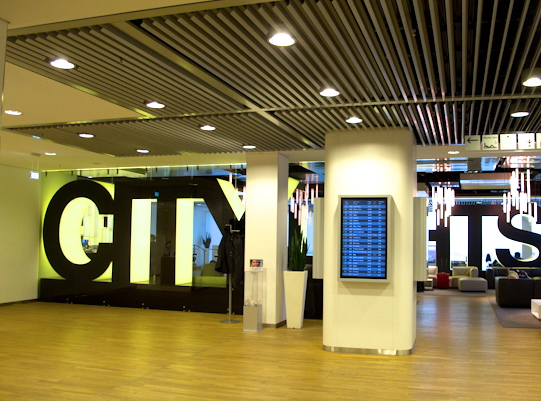 If you're a Business Class passenger but not Star Alliance Gold or an HON Circle Member or have a Senator card, you don't receive access, however. 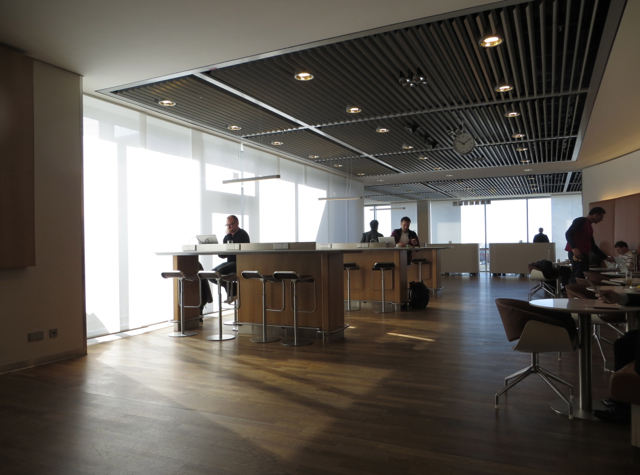 Verdict: Having enjoyed the Lufthansa First Class Lounge in Munich, even though it's a fairly small lounge, my view is that the Lufthansa Senator Lounge, which was apparently refurbished last year, is a huge step down. The seating areas are ok, although apart from the relaxation chairs, not particularly comfortable. 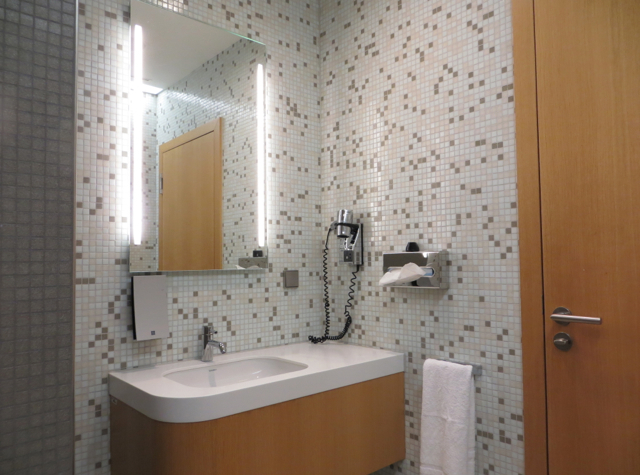 And the modern, spare aesthetic, especially when it comes to the shower facilities, just seems rather cheap. Food offerings were the basics, although even in the Munich First Class Lounge, the real attraction was with the menu and prepared to order offerings, not the buffet. WiFi worked well, however, which was a relief after experiencing only 5 minutes of WiFi for $15 provided by OnAir on my Singapore Suites flight. 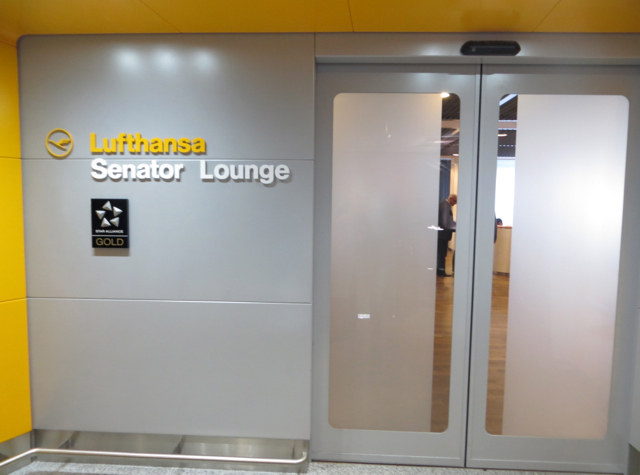 If you've been to the Lufthansa Senator Lounge in Frankfurt, what was your experience? 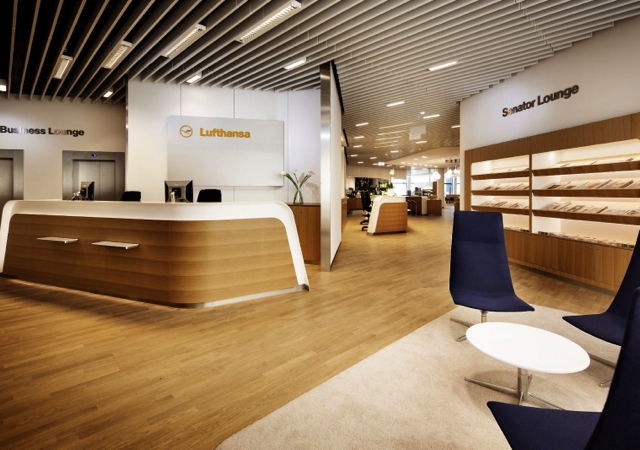 Which Lufthansa Flights Have New First Class and New Business Class?